Cast your minds back to December, when commercial drone operators were on the verge of breathing a sigh of relief having made it through another 12 months without a major drone incident. Then, came ‘The nightmare before Christmas’ when those reported drone sightings in the vicinity of Gatwick Airport grounded planes for 36 hours and caused more than 160,000 people to miss flights. Since I earned my PfCO (Permission for Commercial Operations) licence in 2014, there’s been increasingly nervous chatter within the community about the impact a major drone incident would have on the industry. The potentially devastating consequences of a drone colliding with a plane might trigger a kneejerk reaction, leading to crippling regulations that would make commercial drone operation prohibitively expensive and difficult. For minor drone offences, police will be able to issue fixed-penalty notices, with fines of up to £100 for offences such as failing to comply with an officer when instructed to land a drone or not showing the registration required to operate a drone. Police will be able to search premises and seize drones – including the electronic data stored within the device – where a serious offence has been committed and a warrant is secured. Registered drone users will need to take an online competency test. Many commercial drone users such as myself welcome sensible options that both make our industry safer and weed out irresponsible drone operators who flout the law. That said, none of the above measures would have prevented a determined drone operator from flying within the boundaries of an airport, the only effective way of doing that is to introduce defence systems that disable or take out drones. While there hasn’t yet been the ‘chop off their propellers and throw away their remote controls’ outcry over commercial drone operators, the possibility of a serious incident between a drone and a plane that has unthinkable consequences still lingers. The number of aircraft incidents involving drones has increased from 0 in 2013 to nearly 125 in 2018 and the topic of drones seems to show no sign of falling out of favour with the popular media. 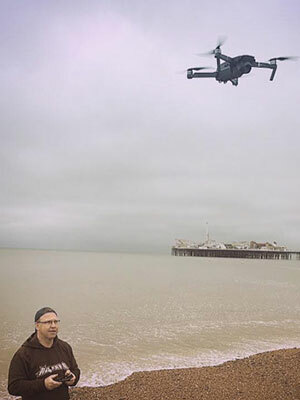 Yet at the same time safety technology being built into drones is increases exponentially – warnings flash up to let users know if they are in a restricted flight area, geo-fencing is built into many models and most drones come with at least some degree of obstacle avoidance, making it ever more difficult to manually fly a drone forwards, backwards or sideways into something. So, what for the future? At time of writing, what happened at Gatwick and the latest drone sighting at Heathrow is still a fuzzy picture. One thing we can say is that as drones get more prevalent in our society, it’s highly likely that one day there will be a major incident between a commercial plane and a drone. But just as we decided not to ban cars after the first collision between two vehicles on the roads, lets hope a sensible approach continues to be taken with drones.